Protect the screen of the Nintendo Switch™ with Screen Armor from Nyko. Screen Armor protects against scratches, chips, fingerprints and smudges. A 9H hardness rating tempered glass screen protector provides top of the line protection and the rounded edges prevent chipping and snagging. The Oleophobic coating helps guard the screen against everyday wear and tear. Screen Armor is thin enough to be applied and allow the console to be docked to enjoy TV Mode. Included in the package is a set of cleaning wipes to prepare the screen before applying Screen Armor. 1. Can I leave the Screen Armor on while the Switch is in the dock? Yes, the Screen Armor is compatible. 2. Can I remove the Screen Armor after it is installed? Yes, you can remove the Screen Armor anytime. The adhesive is not permanent. To remove the Screen Armor, use something that will not scratch glass. We recommend a business card, credit card, or a toothpick. You can also hold a piece of dental floss taut and use that to wedge under the Screen Armor. Do not use a material like metal or glass which can scratch the Switch screen. Place removal tool underneath a corner of the Screen Armor to start lifting it off. Once you have a corner lifted, slowly, and gently lift the entire protector off. Do not pull quickly or you risk cracking Screen Armor. Wait a few days for it to disappear on its own. If bubble remains, use transparent office tape. Remove the Screen Armor using something that will not scratch glass. After it is removed, use the sticky part of the tape to pull off any debris from the screen, and/or the sticky part of the Screen Armor. Then reinstall the Screen Armor using the above installation steps. 4. Does Screen Armor protect my Switch screen from hard impacts and drops? 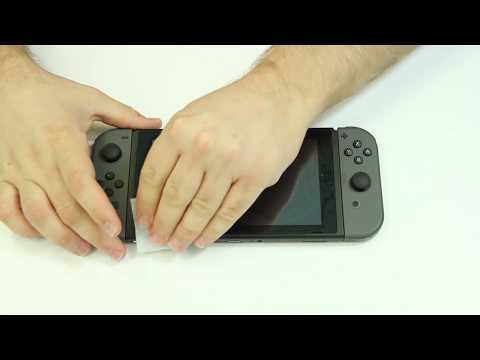 Although the Switch screen is now stronger, and resistant to scratches, please continue to treat your Switch console gently.